Reasoning Ability is an onerous section. With the increasing complexity of questions, it becomes hard for one to give it the cold shoulder. The only way to make the grade in this particular section in the forthcoming banking exams like Canara PO Mains is to practice continuously with all your heart and soul. 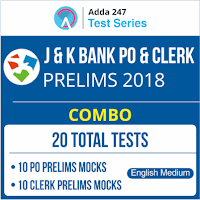 And, to let you practice with the best of the latest pattern questions, here is the Adda247 Reasoning Quiz based on the exact same pattern of questions that are being asked in the exams. Directions (1-5): In each of the questions below is given three statements followed by two conclusions numbered I and II. You have to take the given statements to be true even if they seem to be at variance with commonly known facts. Read all the conclusions and then decide which of the given conclusions logically follows from the given statements disregarding commonly known facts. I. Some light is not sun . II. Some dark is not moon. I. All copy are pen. II. Some copy is book. I. Some TV is LED. II. some TV can be simple. I. Some sand can be hard . II. Some stone is sand. Direction (6-10): Study the information carefully and answer the questions given below. Ten persons A, B, C, D, E, F, G,H, I and J are sitting in two parallel rows such that each row consists of five persons. Persons sitting in row 1 face persons sitting in row 2. D sits in row 1 and sits Diagonally opposite to J. G faces F. Two persons sit between J and E. A is the neighbor of the one who sits opposite to J. C is not the neighbor of A but sit in the same row. Two persons sit between B and H. I sits second to the right of the one who sits opposite to F. H doesn’t sit at any extreme end. Q6. How many persons sit between A and I? Q7. Who among the following faces B? Q8. Which of the following statement is not true regarding B ? Q9. Who among the following faces H? Q10. Who sits opposite to the one who is third to the right of J? Directions (11-15): Read the following information carefully and answer the questions given below. A word and number arrangement machine when given an input line of words and numbers, rearranges them following a particular rule in each step. The following is an illustration of input and rearrangement. Step VI: stress 15 never 25 height 37 ball 72. Q11. Which of the following will be Step III for the above input? Word and numbers rearranges alternately from left to write. First Words are rearranging in descending order according to alphabetical series. Numbers are rearranging in ascending order. Q12. Which of the following step is the penultimate step? Q13. How many more steps will be required to complete the rearrangement? Q14. What is the position of “and” in the last step? Q15. How many elements are between “and” and “ask” in step 3?